The Iron Bridge - office23s jimdo page! The Iron Bridge crosses the River Severn at the Ironbridge Gorge, by the village of Ironbridge, in Shropshire, England. It was the first bridge in the world to be made out of cast iron. In the early eighteenth century the only way to cross the Severn Gorge was by ferry. However, the industries that were growing in the area of Coalbrookdale and Broseley needed a more reliable crossing. In 1773, Thomas Farnolls Pritchard wrote to a local ironmaster, John Wilkinson of Broseley to suggest building a bridge out of cast iron. By 1775, Pritchard had finalised the plans, and Abraham Darby III, an ironmaster working at Coalbrookdale in the gorge, was commissioned to cast and build the bridge. Shares were issued to raise the £3,200 required, and Darby agreed to fund any overspend. Although it had been predicted that 300 tons of iron would be needed (costing £7 a ton), in the end 379 tons were used, costing Darby and his company nearly £3,000. There would be many other costs to bear (masonry abutments, assembly etc), so that the project was far more expensive than first envisaged. Darby bore most of the cost over-run, and was in debt for the rest of his short life. Being the first of its kind, the construction had no precedent; the method chosen to create the structure was therefore based on carpentry. Each member of the frame was cast separately, and fastenings followed those used in woodworking, such as the mortise and tenon and blind dovetail joints. Bolts were used to fasten the half-ribs together at the crown of the arch. Very large parts were needed to create a structure to span 100 feet rising to 60 feet above the river. The largest parts were the half-ribs, each about 70 ft long and weighing 5.25 tons. The bridge comprises more than 800 castings of 12 basic types. The bridge was raised in the summer of 1779, and it was opened on New Year's Day 1781. In 2001, the BBC screened a documentary in which a half-sized model of the bridge was built to test recent research over the construction. Instead of large timber towers, a pair of uprights with a crosspiece was used to erect each of the ribs in sequence. The abutments were built afterwards. Just a few years after the construction of the bridge, cracks were appearing in the masonry abutments, caused by ground movement. Some of the cracks in the cast iron may date from this time, although others are probably casting cracks. They were pinned with wrought iron straps. By 1802, the southern stone abutment had to be demolished, and replaced with temporary wooden arches, before eventually being replaced by iron arches. Many of the cracks visible today in the bridge have been left untouched, however. The bridge was over-designed, and subsequent bridges such as those built by Thomas Telford used much less cast iron. For example, his cast iron arch bridge at Buildwas upstream from Iron bridge, used less than half the weight for a greater span (130 ft span, 170 tons of cast iron). However, it suffered similar problems of abutment movement and was replaced in 1902. The cast iron bridge at Coal port downstream, built in 1818, is even more impressive because of its lean, streamlined design, and still carries vehicular traffic. It was renovated in 2004. In 1972 a program of major repairs took place on the foundations of the bridge. It involved creating a ferro-concrete counter arch under the river. The bridge has been renovated again in 1999-2002, with replacement of the cast iron road plates with steel plates, and a lightweight top surface. Further information on the manufacture of the cast iron parts has emerged. While the smaller parts were cast using wooden patterns, the large ribs were cast freely into excavated molds in the casting sand. 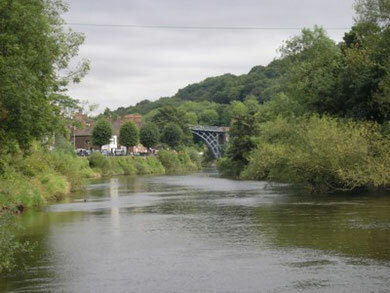 The Iron Bridge became an 18th century tourist attraction, and the settlement of Ironbridge grew up beside it. Although described by many as a town, it falls within the parish of The Gorge. The bridge was finally barred to vehicular traffic in 1934, but tolls for pedestrians were still collected until 1950, when ownership of the bridge was transferred to Shropshire County Council. 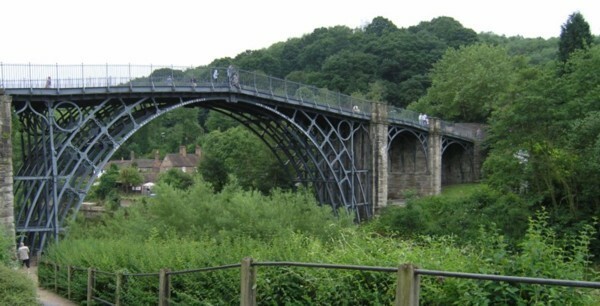 The bridge is a popular tourist attraction, and part of the UNESCO Ironbridge Gorge World Heritage Site. It is a Grade I listed building and a Scheduled Ancient Monument.